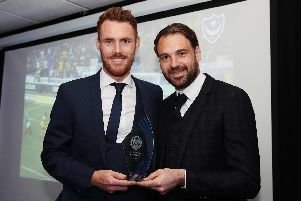 BRANDON HAUNSTRUP toasted his new contract as he declared: I’m ready to become Pompey’s first-choice left-back. The academy product signed a two-year deal on Wednesday to remain at Fratton Park until 2020. It was reward for a fine breakthrough season last term after he made 20 appearances for Kenny Jackett’s side. Haunstrup is delighted to extend his stay at his boyhood club and is now striving for regular starts. And despite facing competition from Dion Donohue and summer arrival Lee Brown for the berth, the Waterlooville ace believes he can make the role his own. Haunstrup said: ‘I’m delighted to get the deal done. ‘The main thing for me was trying to get it out of the way, have a good summer and then get back to pre-season. ‘Now I can do that and fight for my place ahead of next season and hopefully be in a squad that goes up. ‘The main thing now is trying to get more football under my belt and get more minutes than last season. I’m 21 now, going on 22 and I want to nail my spot down in the team. ‘I want to be part of a real winning squad. ‘Upping my game is something I know I need to do (to win a regular place) and I’m looking forward to giving it my best shot. ‘I absolutely feel I can play week-in, week-out. Last season, I made seven starts around December time. Although Brown arrives with more than 250 Football League appearances under his belt, Haunstrup is adamant he can be ahead of the former Bristol Rovers full-back in Jackett’s pecking order. ‘You’ve got to have faith in your ability and confidence,’ he added. ‘Everyone at every club experiences the same thing. Two-year deal shows how highly defender is rated?